Monday evening, the governor of West Virginia declared a state of emergency after a freight train carrying crude oil burst into flames and eventually exploded, displacing over 1000 people and burning one house down. Fortunately, there has only been one injury confirmed. 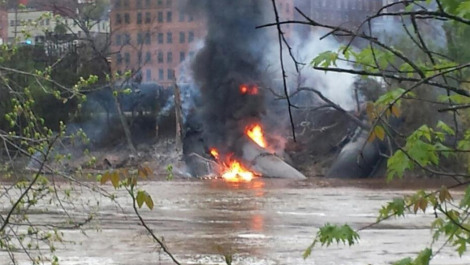 According to reports, of the freight train’s 100+ cars, at least 27 were derailed and 15 caught fire. Part of the incident was even caught on tape as one of the cars blew up into flames and a massive mushroom cloud appeared on the horizon. Making matters worse, though, is the fact that oil from the train also dumped into the Kanawha River– the major source of water for Kanawha county and Fayette county. So far, it appears that at least 2,000 people will be without water as two different water treatment facilities confirmed that they will be shutting down to investigate just how polluted the river is. “Customers in the Montgomery area are asked to conserve water and only use it for essential functions,” said West Virginia American Water in a statement. The initial derailment of the CSX owned train is said to have happened at approximately 1:20 p.m. ET. On the scene, a Montgomery volunteer firefighter said that explosions continued an astonishing ten hours after the initial derailment with the biggest blast coming around midnight. Even now, firefighters are worried that there still may be a few more explosions to worry about. This entry was posted in Culture and tagged crude oil, explosion, freight train, Kanawha River, train, train derailment, west virginia, West Virginia American Water. Bookmark the permalink.